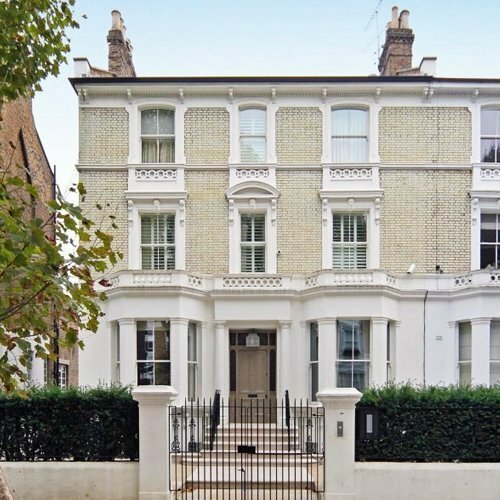 According to property website Zoopla, the plush five-storey Victorian villa featured in the current series of hit reality TV show The Apprentice costs just over £29,000 a month to rent, and is worth around £13 million. The contemporary curved staircase rising from the TV room is just one example of the lavish nature of the makeover carried out by celebrity designer Nicky Haslam, whose customers include Mick Jagger, Rod Stewart and Ringo Starr. Few of us can afford to splash out hundreds of thousands of pounds on our homes. But it's always possible to adapt some interior design elements to a lower budget, and that includes the stairs. You may not be able to afford Mick Jagger's designer, but you can achieve a similar effect with one of our bespoke curved staircases for less than a single month's rent of that Notting Hill mansion, with a fair amount of change left over. How come? 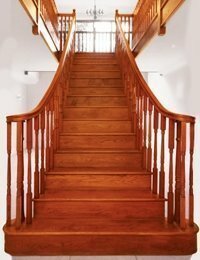 Well, at Pear Stairs we lead the way in curved staircase technology. Our skilled craftsmen have spent more than 20 years perfecting the art of making these graceful structures; and while it’s true that they usually cost more than straight flights, they do make a stunning focal point and are regarded as a great investment. 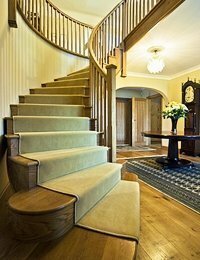 Each of our curved staircases is unique and specially designed for individual clients. We only use top quality solid timber - no engineered or laminated wood. American white oak and European oak are the most popular choices, but other timbers are available. 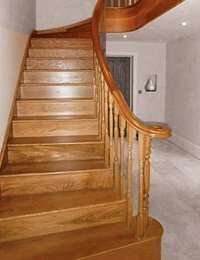 Of course, curved stairs can often require a lot of space – but if your home has more in common with The Hobbit than The Apprentice, a partly splayed staircase can be a good compromise. This design works well for stairs set against a wall, as only the outer side of the staircase is splayed (spread outwards). The end result will still look luxurious, but take far less space out of the room. An excellent example of this design is the Carrodale staircase (pictured below left). 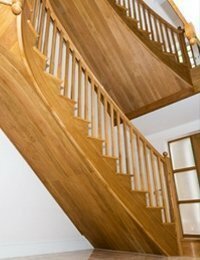 This is just one of many curved and splayed stairs featured in our Case Studies section.